Australia’s farm sector has teamed up with the national collective of regional organisations responsible for the delivery of natural resource management investment and initiatives to assist to deliver improved sustainability outcomes. 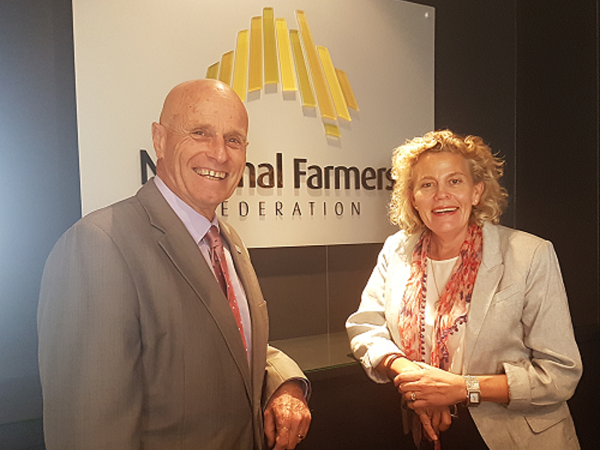 NRM Regions Australia and Chair of West Gippsland Catchment Management Authority Angus Hume (lt) and National Farmers’ Federation President Fiona Simson (rt) have agreed to develop a formal memorandum of understanding to enhance the way industry and the regions work together to deliver projects that benefit farmers and the environment. “Working with NFF will mean that we can design the program settings in a way that maximises this opportunity,” Mr Hume said. Wheatbelt NRM Council Inc. 47 organisations to deliver the $450 million RLP program.